Inspired by Jules Verne’s classic adventure tale, celebrated editor-in-chief of The Wine Economist Mike Veseth takes his readers Around the World in Eighty Wines. The journey starts in London, Phileas Fogg’s home base, and follows Fogg’s itinerary to France and Italy before veering off in search of compelling wine stories in Syria, Georgia, and Lebanon. Every glass of wine tells a story, and so each of the eighty wines must tell an important tale. We head back across Northern Africa to Algeria, once the world’s leading wine exporter, before hopping across the sea to Spain and Portugal. We follow Portuguese trade routes to Madeira and then South Africa with a short detour to taste Kenya’s most famous Pinot Noir. Kenya? Pinot Noir? Really! The route loops around, visiting Bali, Thailand, and India before heading north to China to visit Shangri-La. Shangri-La? Does that even exist? It does, and there is wine there. Then it is off to Australia, with a detour in Tasmania, which is so cool that it is hot. The stars of the Southern Cross (and the title of a familiar song) guide us to New Zealand, Chile, and Argentina. We ride a wine train in California and rendezvous with Planet Riesling in Seattle before getting into fast cars for a race across North America, collecting more wine as we go. Pause for lunch in Virginia to honor Thomas Jefferson, then it’s time to jet back to London to tally our wines and see what we have learned. Mike Veseth is professor emeritus of international political economy at the University of Puget Sound. He is editor of the award-winning blog The Wine Economist and author of several books on the business and pleasure of wine, including the best-selling Wine Wars, Extreme Wine, and Money, Taste, and Wine, which received the 2016 Gourmand International award for “Best in the World” wine writing. He’s currently working on his next book when he isn’t traveling around the world with his wife, Sue; speaking to wine industry groups; and looking for great wines and great wine stories. 2 France: Which Bottle? Which Wine? 16 Back to London: Victory or Defeat? Veseth, a wine writer and professor emeritus at the University of Puget Sound, has penned an informative work that will entertain any wine lover. Drawing inspiration from Jules Verne's classic novel, Veseth becomes a latter-day Phileas Fogg, bringing his reader on an adventure in wine history, grape cultivars, geography, climate, and economics that follows the fictional character's journey around the world. Since he limits his sampling to just eighty wines, readers might likely disagree with his wine choices from some well-known regions and marvel at the existence of wine in others. Really, Pinot Noir in Kenya? But the reader is given justification for choices made... [T]he wealth of material and the author's thoroughly enjoyable approach make this a valuable addition to any collection. Summing Up: Highly recommended. All readers. Inspired by Jules Verne’s Around the World in 80 Days, Veseth’s personal journey through the complex and compelling world of wine starts and ends on London’s St. James’s Street, home to fine-wine merchants Berry Bros. & Rudd since 1698. Along the way, Veseth tours Bordeaux and Burgundy, where some of the world’s best wines are made, and visits the more uncharted wine-growing territories of Bali, Thailand, and Tasmania. Veseth chooses the wines he profiles based on the ability of each to excite the palate, and the imagination: 'Each of [the] eighty wines must tell a story, [but they] must not just each tell their own story.... They must collectively form a picture and tell a story that reveals a greater truth,' he writes. As a result, reading his book is rather like attending a swanky cocktail party: it contains a vast and varied buffet, with loads of interesting conversational tidbits. The book makes for an entertaining introduction to the world of wines. As an added bonus, the author also provides a bibliography for those wishing to delve deeper into the topic. Veseth undertakes a global adventure seeking stories of the people, places and cultures that are the essence of what makes wine so unique: an intoxicating enchantment that draws in people from all walks of life. Casting off from the history Berry Bros. & Rudd wine shop in London, Veseth embarks on a long and fascinating trip that includes not only expected areas, like France, Italy, Australia, and California, but also places less known for wine making, such as Syria, Kenya, and Virginia. Each leg of the journey is documented through interesting stories, with a small selection of representative wines listed at the end of the chapter. A wine economist, Veseth often discusses the varying impacts such influences as war and climate change have on the wine industry in the particular regions.... The final list of wines discussed is much longer than the 80 that readers will anticipate. Through reading, we can taste meals never eaten or savor wines not yet swallowed. A satisfying book transports readers; a memorable book also transforms them. . . . This non-fiction work takes readers on a rapid, engaging skip and skim around the globe—highlighting the diversity of wines now produced across the planet. . . . An entertaining smatter of the eclectic, a trove of stories and facts not found in other books about wine. [An] erudite soul, Mike ‘The Wine Economist’ Veseth, treads a playful path throughout Around the World in 80 Wines, replicating Jules Verne’s classic Around the World in 80 Days. Besides citing and assessing scores of great wines, Veseth breaks out of stuffy academia, seeking out which Spanish wines most exemplify soccer powerhouses Real Madrid and Barcelona, or tracking down and profiling ‘The Mondavi of Mumbai.’ During his journey shadowing the route of Phileas Fogg and Passepartout, readers can glean fascinating minutiae (Thailand’s biggest wine producer is a man who co-founded Red Bull) or go more in-depth on topics such as riesling’s identity crisis or how a major peso crisis helped spawn Argentina’s booming malbec industry. Around the World in Eighty Wines pulls together research from [Veseth’s] extensive travels and highlights wines that tell stories about the world’s vintners and vineyards…. Veseth uses the wines to explore interesting questions of history, economics, terroir and taste. And his enthusiasm for the people he meets and the stories they tell should encourage wine lovers to take a voyage of their own, pushing beyond their comfort zones to explore the vast and surprising world of wine. This follows the path of Jules Verne’s Around the World in Eighty Days, picking up a glass in each of the 80 locations. A breezy, easy to follow sampler of wines from… well, everywhere, including Shangri-la, this book has a good sense of humor and a wide-ranging, bird’s-eye perspective. It will digress into history, marketing, economics, culture, politics and religion and take you right along with it. A really fun and engaging read that will make you want to start planning an 80-wine whistle-stop tour of your own. If you are like me, great wine and good food are two things that have the ability to enhance your happiness in life…. [This book] can help elevate those already good moods. 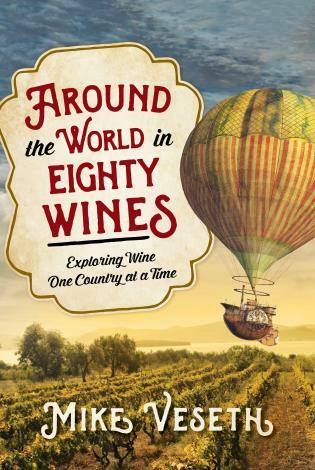 In his latest book, Around the World in Eighty Wines, Mike Veseth tries to answer the question, ‘Why wine?’ Inspired by Jules Verne’s classic tale, Veseth follows Phileas Fogg’s journey around the world to explore why wine is a source of such enjoyment, passion and obsession. The answer: ‘Wine fills your glass, but it can also fill your heart and focus your mind.’ Despite battling war, poor economic conditions and changing climates, winemakers in every corner of the world remain dedicated to their craft. As Veseth scours the world for the best bottles of wine, he regales the stories of these winemakers, not just in the usual places like Italy, France and the U.S., but in often-overlooked countries like Algeria, Georgia, Lebanon, Shangri-La, Syria and Tasmania. Mike Veseth has deftly captured the magical worldwide journey of wine. This is a great rollicking educational roller coaster of a ride that the global fraternity of wine enthusiasts will embrace. Like a master blender, Mike Veseth stimulates the mind's appetite with a wonderful balance of illusion and substance, as complex as a fine wine. Structured with cultural nuance and imagination, this delightful book is a must-read for serious wine enthusiasts and neophytes alike. Circumnavigating the world in eighty wines should be enjoyed with a glass of your favorite 'origin' in hand. This captivating book is about more than just wine—it’s about human nature, travel, and enjoyment. As the Rick Steves of the wine world, Mike uses his rich talents as a writer and storyteller to transport the reader to a new territory to explore as each of the eighty wines is opened. Mike Veseth takes the reader on a Phileas Fogg–inspired odyssey in search of the answer to the question: why wine? The solution is a true global adventure—a mosaic of stories that illuminate wine beyond the glass to embody the enduring human spirit through controversy, love, loss, and hope. I was packing my bags to join the journey before the end of part I. A must-read for all who love wine and life. This adventurous book shows us that wine is about more than what’s in the glass: it is about meeting new people and discovering vibrant cultures and amazing landscapes. Mike’s engaging storytelling reveals the histories behind the wine he tastes, which are often just as complex and delightful as the vino itself. Why these particular places? What are the eighty wines and what do they reveal? And what is the surprise plot twist that guarantees a happy ending for every wine lover? Come with us on a journey of discovery that will inspire, inform, and entertain anyone who loves travel, adventure, or wine.